Alex also pointed out an article in the ‘Glasgow Herald’ of 8th April, 1872, of a race involving Alex McPhee, Snr. KILMARNOCK ATHLETIC SPORTS. On Saturday a number of foot-races took place in the Cattle Market. The weather being very favourable, there was a large turnout of people, the majority of whom were from the neighbourhood. … The chief feature of the meeting was a Six Mile race which was very well contested, and excited considerable interest. The following were the prize-takers: Six Mile Race: 1st William Smith, Paisley; 2nd Alex McPhee, Paisley; 3rd Allan Strachan, Galston. Two Mile Race: 1st Robert Hindle, Paisley; 2nd William Smith; 3rd Alex McPhee. So Duncan had a very good background in the sport and a family with a record of long involvement and success. Like brother Alex, he started out as a member of Clydesdale Harriers and the first mention in the club’s annual handbook was in the 1912/13 edition when he had been a member of the team that was second in the West District Championship – he had been third counter, finishing 8th. The club at that time tended to use the top men for the National and the ‘second string’ for the District and sure enough, big brother Alex was noted as finishing twentieth in the National Championships. In June 1913 in the Clydesdale Harriers Sports held in Clydebank, he won the One and a Half Mile Handicap from a mark of 65 yards in 7 mins 11 3-5th secs. 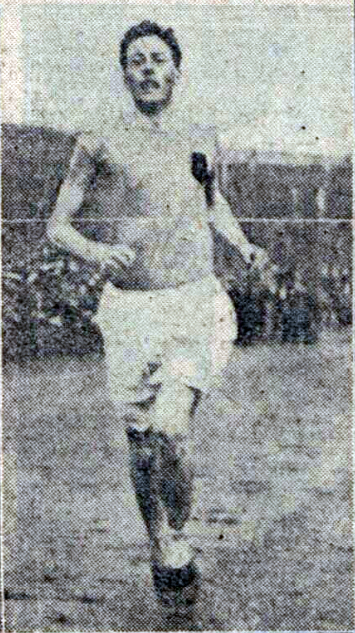 Two weeks later he won his first SAAA Championship in 4:34 by inches from DF McNicol of West of Scotland eliciting the comment from the ‘Glasgow Herald’ that “McPhee is a young runner who has come rapidly to the front.” This victory earned him selection for the international with Ireland at Celtic Park, Belfast, where he won the Mile in 4:34.6 from another Scot, WM Crabbie. His next outing was on the first Saturday in August at the Rangers Sports where he competed in the half-mile. “The half-mile handicap was notable for the fine running of Duncan McPhee, the Scottish mile champion. Starting from 23 yards he won his heat easily, and in the final he beat E Owen, Broughton Harriers, who was on the 8 yards mark, by about his start, and going on for the full distance he was timed to do 1 min 58 4-5th sec – only 2-5th sec outside the Scottish native record.” The ability of runners in a handicap race to go beyond the finishing line to a mark equal to their handicap so that they could get an accurate time for the distance, while having the incentive of a handicap race with a series of ‘hares’ was one of the positives in the handicap racing which was typical of the time. The alternative of a scratch race in which the best runner had no opposition was not as conducive to good times. Duncan’s reward for this was to run off scratch himself in the 880 yards the following week at the Celtic FC Sports, organised by Willie Maley. He could only finish second in a race won by G Kitson of Shettleston, running off 50 yards, who only won by about 3 yards. It had been a good season with victory in the SAAA Championships and in the International with a flourish at the finish with two good runs in the Rangers and Celtic Sports. The following winter (1913/14) Clydesdale Harriers handbook reported that D McPhee won the Mile in 1913 when he competed for the first time in a championship event, and that he had been second in the club 5 miles handicap, third in the West District championship where the team was placed fourth. He was also on the club committee as Vice-Captain and a member of the handicapping sub-committee. And then, for a reason as yet unclear, both Alex and Duncan moved allegiance from Clydesdale Harriers across the city to West of Scotland Harriers. On 27th June he won his second SAAA Mile title in 4 min 37 1-5th sec and the half mile in 2 min 3 1-5th sec from former club mate Ralph Erskine (Clydesdale and GUAC) with George Dallas third. Erskine is a very interesting character: his father was a founding member of the club and his brother T Barrie Erskine was one of the joint secretaries at the outbreak of war. Ralph himself won a world lightweight boxing title – amateur of course – in New York and unfortunately, like his brother, was killed in the War. After the championship Duncan was selected for the international to be held later in the summer. McPhee ran well enough to be third in the AAA’s championship in his first venture south of the border before heading to Hampden for the match against England and Ireland on 11th July in which England won 6 events, Scotland 3 events and Ireland 2 events. McPhee won the Mile in 4:30.8 from Alexander of Ireland and E Owen of England. He travelled to Celtic Park for the Maryhill Harriers meeting on the 18th but missed the start as ‘the race was well in progress before he was called by the steward.’ In the Greenock Glenpark Harriers meeting on 27th July, McPhee was the lead-off man for the West of Scotland relay team which won comfortably and he also ran in the handicap mile off scratch and finished third. Entered for the three miles team race, he decided not to run after the other two events. On Monday August 3rd at a meeting promoted by Rangers FC, there was a special mile with the 22 entries including the following: AG Hill (Polytechnic Harriers) 10 yards, E Owen (Broughton Harriers) 30 yards, SS Stevenson (Clydesdale Harriers) 40 yards, D McPhee (West of Scotland) 20 yards, CR Robertson (Auckland Harriers, NZ) , Alex McPhee (West of Scotland) 80 yards, and the limit man (T Barrie Erskine, Clydesdale Harriers) had 140 yards. The result at the Monday evening race was a win for Hill in 4 min 25 3-5th sec, from McPhee. The season drew to a close with McPhee having ‘done the double’ at the SAAA Championships for the first time, won the international and won a medal at the AAA’s in London. A successful season full of promise – unfortunately on the world political scene, there were events taking place that would put more careers on hold than his and the next SAAA championships was to be in 1919. As with many others, the 1914-18 War must have caused significant disruption but few could have won three SAAA titles, including a double in 1914, missed the War years and not restarted his career properly until 1920 and then gone on to more honours in Scotland, England and internationally. In the preview of the 1919 championships, the ‘Glasgow Herald’ correspondent noted that “D McPhee, the half-mile and mile champion, is still on service abroad” and he did not contest the championships that year. By 1920 he had lost more than five years of his athletic career. He was home and back in athletics harness in 1920 however and he was to become the best Scottish middle distance runner of the early 1920′ s before Tom Riddell came along. On May 22nd, 1920, McPhee turned out in the Kilmarnock Harriers Open Sports Meeting where the ‘Herald’ merely notes that none of the fancied runners reached the prize list, including McPhee in this. At the start of June, the fifth, he avoided the Queen’s Park Sports at Hampden preferring to run in the joint Bellahouston Harriers and Dumbarton FC Meeting at Dumbarton where he was back-marker in the Mile. He ran ‘a grand race but was unable to get through the large field of 69.’ Not surprising – 69 runners on a track round, or possibly on, a football pitch would have been a bit of a crowd! On 12th June, 1920, there was an Olympic Trials meeting at Ibrox and of course all men with pretensions at 100 and 1500m were there. It was an ordinary meeting organised by West of Scotland Harriers and Pollokshaws Royal Arch Lodge No 153 which included Olympic trials at the distances mentioned. The ‘Notes’ read: “McPhee showed a fine turn of speed and staying power in the 1500 metres. McPhee has lost none of his old-time ability and should give a good account of himself in the championships towards the end of the month. He had not a little to do with the winning of the relay race for his club, the West of Scotland Harriers, who thus checked the victorious career of Maryhill Harriers”. McPhee won the race in 4 min 16 4-5th secs from James Wilson by a distance of 10 yards. He was back at Ibrox the following week for the Clydesdale Harriers meeting and finished second in the half-mile, running from scratch One week later was the SAAA Championships, for him the first since the War. “McPHEE’S RETURN TO FORM. Duncan McPhee justified the optimism of those who have watched his return to form by regaining the two titles which he won in 1914, and which he was unable to defend last year. In the Mile he displaced the holder of the title, WB Ross, who was far in the rear at the tape, while in the half-mile he had another comfortable win from a fancied candidate, WR Milligan of Oxford University AC.” His times were 2:0.6 and 4:26 and the performances gained him selection for the triangular international at Crewe on 10th July. The week after the SAAA was the AAA’s championship and McPhee travelled south to compete – and finished second to the Frenchman, A Burtin, and was first Briton to finish. Then came the International at Crewe where he won the Mile in 4:30.2. This concluded five races in five weeks including Olympic Trial, SAAA and AAA Championships and the international! He made it six weeks in a row when he competed in the new meeting at Rothesay promoted by West of Scotland Harriers. There he was third in the 880 yards, running from scratch, and first in the Mile, again running from scratch. After a week out, he was back in action on the last Saturday in July at the Greenock Glenpark Harriers Sports where, running from scratch, he was third behind JG McIntyre (Dumbarton – 95 yards) and CE Blewitt (Birchfield Harriers – 20 yards). The first Saturday in August meant only one thing – The Rangers Sports at Ibrox. McPhee was running in the invitation 100 yards against the ex-AAA Champion AG Hill who set a new all-comers record of 2:15 and behind him McPhee set a new Scottish native record of 2:16. This was said to have affected him adversely because, after winning his heat in the handicap half-mile, he retired in the final and did not start in the Mile. For most Scots, and indeed for McPhee himself, the summer usually finished in the first or second week of August. But Duncan McPhee was not yet finished for the season. There was the matter of the Olympics to come. The first post-war Olympics were held in Antwerp between August 14th and September 12th and there were 22 sports being contested. Invitations were not sent to Germany, Austria, Bulgaria, Turkey or Hungary although they were not forbidden to come. 29 countries were represented. The 27 year old McPhee was taking part in two events, the first of which was the 1500m with heats on 18th August. He ran very well to finish second in the second of four heats in a time of 4:07.2 – two tenths behind Lundgren of Sweden and two tenths ahead of Shields of the USA. The English champion, Burtin, was fourth and did not qualify for the final. The final was held the next day. Run in the rain, the 1500m final was pronounced the race of the day with Ray of the USA making the pace right from the start but Hill and Baker held back before coming through to take first and second. McPhee did not finish in this fast race. He was also a member of the British four-man 3000m team race with Hill, Blewitt and Seagrove. The heats for this race were on 21st August, and McPhee led the GB team home when he was second in 8:59.1, again behind Lundgren, but ahead of Zander (also Sweden) with Blewitt and Seagrove fourth and fifth. The British team won their way through to the Final. But again McPhee dropped out but he did get a team silver since he was part of the GB six-man team. His season was now really at an end and it had been a good one too, could 1921 be as good, was the question. 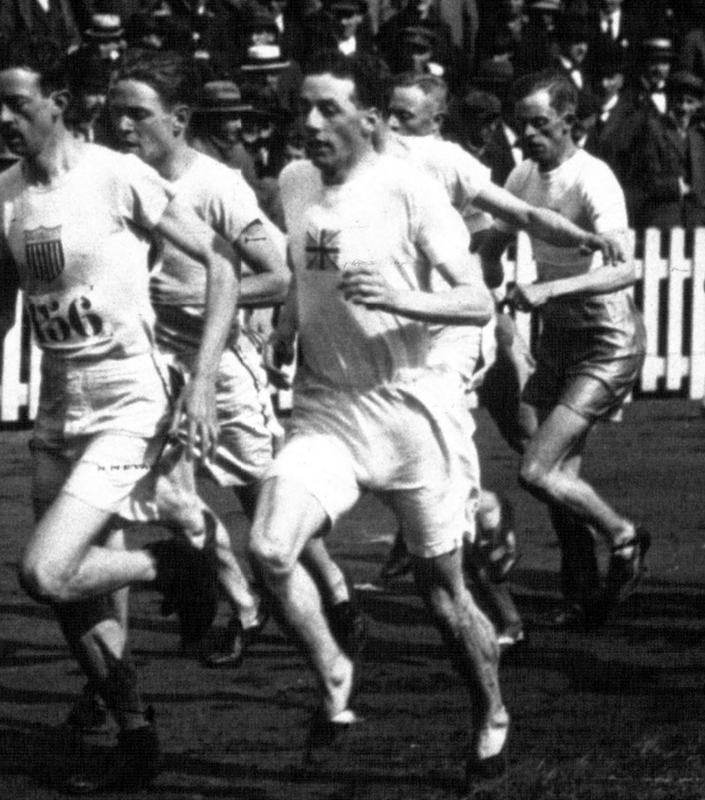 The start of the Olympic 1500m final, 1920. McPhee second left: note the crouch starts! On the last Saturday in May, 1921, McPhee was running in the Shettleston Harriers meeting at Celtic Park. The attendance was poor and the scribe for the ‘Glasgow Herald’ remarked that “In some events the crowds were embarrassingly large, the half-mile with an entry of 113 having to be run in four heats. Five half-mile races are too many for one afternoon, especially at this season when men of outstanding ability are hard to find. D McPhee, the champion, did much to redeem the race of dullness by his judgment in the heat and success in the final, and the runner-up, D Massey, is to be complimented on drawing out McPhee all the way to the tape.” Running from scratch, he won in 2:01. June was championship month and McPhee began on 5th June in the Inter-City Mile Relay between Glasgow and Edinburgh at the Queen’s Park FC Sports by running the first 880 yards stage for the winning Glasgow team. 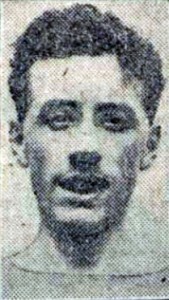 He followed this with a victory at the Corporation Tramworks and West of Scotland Sports meeting at Ibrox against 100 opponents in the Mile, and a fine ‘win’ over George Dallas on the first stage of the relay -“the most interesting race on the programme.” He won the Mile by half a yard in 4:32 from club mate JG Scott (135 yards). On to the SAAA Championship on the last Saturday in the month and the comment on the middle-distance races was: “Duncan McPhee retained his two championships, the half-mile and the mile. The latter, through no fault of the winner, was a somewhat hollow victory. Though there was an entry of eight, only one turned out and it is to the credit of I Dobbie that he made a race of it, knowing that he had a very slender chance of winning.” The half-mile was won by three yards in 1:58.6 and the Mile in 4:45.4, also by three yards. The AAA’s championship was the following week but McPhee chose to run at Tynecastle in Edinburgh in a meeting organised by the Heart of Mid-Lothian FC. He ran in the medley relay and West of Scotland won, “Thanks to McPhee’s brilliancy”. He also won the Mile Handicap from scratch in 4 min 23.4. He did however miss a particularly fine Mile race at the AAA’s where AG Hill and Hyla Stallard fought out a hard race with Hill winning in a record time of 4:14.2 . As winner of the SAAA titles, McPhee was selected for the international match in Belfast on 9th July in which Scotland was victorious, winning 6 events to England’s 3 and Ireland’s 2. He duly won the Mile in 4:32.2. He next ran the Mile in the West Kilbride Sports a week later which he won from scratch in 4:42. His next outing was not so successful – at the Greenock Glenpark Harriers meeting where the entire event was held under a real downpour, he could only finish second in the Invitation 1000 yards. In the Rangers Sports the following week, “McPhee romped home in the half-mile and again in the three-quarter-mile. In the latter event he received 20 yards from AG Hill, the one mile champion of England, who did not seem to run to anything approaching the form he disclosed at Stamford Bridge last month. In the finishing straight McPhee travelled faster than the Englishman and secured his second win of the day.” Times were 1:59.8 and 3:09. The Celtic FC Sports were held the following week and although there was an invitation mile handicap but there was no Duncan McPhee and the race was the poorer for it since there was no one to ‘pull out’ AG Hill. It had been a good season for Hill and although there was no Olympic Games to target, he was clearly the best middle-distance runner in Scotland and one of the best in Britain. 1922 had its own problems for Scottish athletics. We have all read of the great depression of the 20’s but little has been written of its effect on sport, especially as far as the Scottish situation is concerned. There was a paragraph in the ‘Cricket and Athletics’ column of the ‘Glasgow Herald’ of 8th May of that year which should be taken into account as far as the season is concerned. The sport was not immune from the political situation – there was a note in the ‘Clydebank Press’ a few years later, for instance which reported that a runner had had the good fortune to get a job but “unfortunately for us [the club] it is of the Saturday variety’ and he would not be available for racing. This is the context in which McPhee was racing in 1922. His season started on the first Saturday in June at the Queens Park FC Sports where he was in the Inter-City Mile Relay running the half-mile in a running order which did not start with the 880 runner. Eric Liddell ran for Edinburgh on the 440 yards leg and the report is taken up there. “He (Liddell) ran better in the inter-city race, which would have been won by Edinburgh, but for the fine half-mile by D McPhee, the champion of the distance. On starting McPhee was some 15 yards behind CB Mein; at the finish he was two yards in front, the Edinburgh runner being harassed by the strong by the strong adverse wind in the straight.” The following week at the joint West of Scotland Harriers and Glasgow Corporation Tramways meeting he again ran in the relay for the winning team but appeared nowhere else either in the prize list or in the comments elsewhere. In the joint sports organised by Edinburgh Southern Harriers and Hibernian Football Club, McPhee ran in the mile but was unplaced. Thereafter it was the SAAA Championships at Powderhall on the 23rd June. The ‘Glasgow Herald’ commented that his running the previous week had given some cause for some anxiety but he had shown his accustomed judgment and won both half-mile and mile. The former was timed at 2 min 2 sec from CB Mein, and the latter at 4 min 31 1-5th sec from CS Brown. In both cases the runner-up was representing Edinburgh University and in both cases he won by two yards. The SAAA’s was followed a week later by the AAA’s championships on 1st July at Stamford Bridge. This time McPhee did travel to the big event. “There was a great surprise in the Mile, the Glasgow runner, D McPhee, beating HB Stallard. Without grudging the winner his success, it was a disappointment to everyone to see Stallard go down in such moderate time as 4 min 27 2-5th sec. He cannot be nearly as good as he was a year ago, but apart from this he ran with bad judgment, hanging behind in a very slow second lap instead of going to the front and ensuring a good pace. He trusted to a sustained effort in the last quarter of a mile, but he could not keep it up to the end, McPhee passing him in the straight and winning by three yards.” McPhee now had English gold to add to the bronze won in the half mile in 1914. Two weekends, three gold medals. The last remark refers to the fact that the triangular match had started in 1914 when McPhee won the Mile, a feat he had repeated in 1920 and 1921. His next outing was at the Greenock Glenpark Sports at Cappielow Park where he disappointed the spectators by not running in the half-mile, reserving himself for the invitation 1000 yards – where he retired 40 yards from the tape ‘when he realised that any further progress was impossible.’ The Rangers Sports at the start of August took place in the finest of weather before a crowd of 30,000. What more could an athlete ask but it was another disappointing week-end for McPhee’s supporters. He did not run in the handicap half-mile which would have meant two races (heat and final) but went instead in the invitation half-mile where he could only finish fifth. He redeemed himself in the Mile which he won from scratch by four yards in 4 min 23 4-5th sec from McIntyre of Shettleston Harriers. In the Celtic FC Sports seven days later he won the half-mile fairly comfortably in 1:58 which was faster than the native record but he had started from the six yards mark. He also ran the open mile where he finished second to Copeland of Motherwell (off 120) and ahead of JG McIntyre of Shettleston (off 60) in 4:28. McPhee was running at a time when there were several very good athletes around but one of the very best was Eric Liddell and the two often turned out for Scotland together in the triangular international: on this day at the Celtic Sports Liddell won the 120 yards scratch race in an astounding 12.2 on a track not known for being one of the fastest. It had been a good season with the victory in the AAA’s over Stallard probably being the high point. 1923 – McPhee’s last year at the top – started out on 4th June with a run in the Inter-City Relay at the Queen’s Park FC Sports. Glasgow won and the comment was that “as long as Glasgow are able to call on the services of D McPhee they are likely to win.” On 9th June in the relay for the prestigious Wyoming Cup, McPhee running the relay brought the club home first on the 880 yards stage, despite the fine running of a young opponent in George Malcolm from Edinburgh Southern, for their fourth consecutive victory. The following Saturday saw a return of the Edinburgh Southern Harriers and Hibernian Football Club Sports at the football club’s ground. McPhee ran in both mile (‘D McPhee ran a strong race but was unplaced.’) and half-mile (‘McPhee again ran strongly but was unable to take his full field.’) but with no material success. In the SAAA Championships on 23rd June, McPhee won both half-mile and mile for the fourth consecutive year. “McPHEE’S FINE RUNNING. The one mile race was somewhat disappointing, only three men turning out to challenge the champion. G Malcolm was his most formidable opponent, and for some time it looked as if McPhee’s title was in danger. His finishing sprnt however was one of the features of the meeting, redeeming the race to some extent from the dullness caused by the poor field. In the half-mile the champion was strongly challenged by C Brown but here again he showed, as he has often done before, that a challenge only serves to provide him with the speed necessary to shake it off. Great things will be expected of McPhee at the international next month, as well as at the AAA’s championships.” The half-mile was won by a yard in 2:01, and the mile by 30 yards in 4:34.6. In the Glasgow Police Sports seven days later, McPhee ran disappointingly in the half-mile and did not turn out in the Mile “having left for Edinburgh” before the event started. He then travelled to the AAA’s the following week but the report tells us that “It was hoped rather than expected that D McPhee would retain his title in the mile championship. The Scotsman appears to have gone somewhat stale since the Scottish championships, and, moreover, the winner’s time was considerably faster than any he has ever done, and in fact equals the Scottish native record.” Stallard won the race by 150 yards in 4:21.6 and ‘the Scotsman was never in the running’. The triangular international was McPhee’s chance for revenge over Stallard but it was not to be and Stallard made the score 3-1 in his favour when he won from McPhee in second place in 4:23.2. At Glengarnock on 21st July, he ran in both half-mile and mile but without getting far enough through the field to feature on the prize list, it was the same story at the Greenock Glenpark Harriers race at Cappielow the following week and the tale at Ibrox at the start of August was no happier. “D McPhee’s running at no time made its usual appeal. In the one and a half mile invitation handicap he decided to forgo his start of 16 yards, and along with CE Blewitt got off from the scratch mark. Neither the West of Scotland man nor the Birchfield Harrier had a say in the finish. McPhee dropped out from the race with little more than a quarter to go. T Riddell of Glasgow High School almost provided a rich surprise here, but the reserve power behind the Maryhill man, WH Calderwood, was too much for this youthful runner. In the mile handicap McPhee introduced more spirit into his effort but at no time did he look like challenging the placed men.” Not a good spell for McPhee but note the young Tom Riddell mentioned who would soon take over McPhee’s pre-eminence in the mile. His name does not appear at the Celtic Sports the following week although Tom Riddell had another good run, finishing third in the open mile. Into Olympic year and like every other athlete in the kingdom, McPhee must have been hoping for the team selection. Unfortunately his name was not only missing from the results, but it was noted several times that ‘had Duncan McPhee been running …’ Came the SAAA National Championships on 14th June Duncan McPhee had to miss them because of injury ‘and had he done so the old brigade might have made a better appearance.’ Nor does he seem to have raced at all in season 1924 and to all intents and purposes, his athletics career had come to an end. It had been a marvellous career with nine Scottish championships, one AAA’s championship, three wins in the International Mile and selection for the 1920 Olympic Games in Antwerp. The only honour missing was the lack of a Scottish record at either 880 yards or One Mile – although he did set records at 1000 yards (2:16.0 in 1920) and three-quarters of a mile (3:12.2 in 1921). The SAT website at www.scotstats.net also refers to his 1920 3000m time of 8:59.1 as an inaugural Scottish record which would give him another record. Bearing in mind that military service took him out of competition from 1915 to 1919 between the ages of 23 and 26 inclusive it has to be believed that he could have done and won so much more.